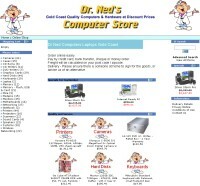 Overview: Linden Stewart has been running a small computer hardware business for 5 years on the Gold Coast near Brisbane. In December 2002 he decided to build a web site to promote his business. After getting "brain strain trying to learn all this" he contacted 12website.com. We were able to build an E-Commerce web site for Nednil Computers using a system where Linden is able to maintain his inventory himself. "After our first extensive phone call, Neil's approach was of the the utmost professionalism, and he didn't even scoff at my very very low budget to get a shop online, instead Neil worked within my budget. At no time was I ever made to feel less important than his other customers with bigger budgets." Linden has his e-commerce web site which is adding value to his existing business by using the web's ability to penetrate markets he did not previously reach. Linden now offers web design solutions through 12website's tutoring program.